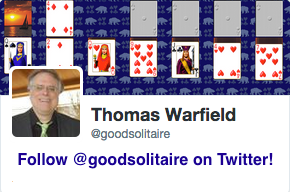 Screen shot of the game Triple FreeCell from Pretty Good Solitaire. 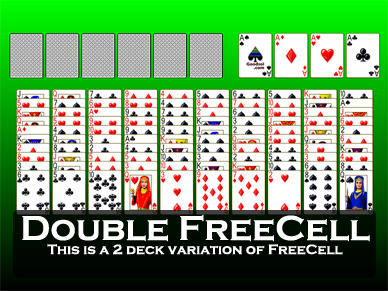 Triple FreeCell is a 3 deck version of the game FreeCell, invented for Pretty Good Solitaire by Thomas Warfield. In Triple FreeCell, there are 13 tableau piles. All of the cards are dealt to the tableau at the start of the game, 12 cards face up to each pile. There are twelve foundation piles, which will be built up in suit from Ace to King. When all of the cards have been moved to the foundation piles, the game is won. There are ten cells. 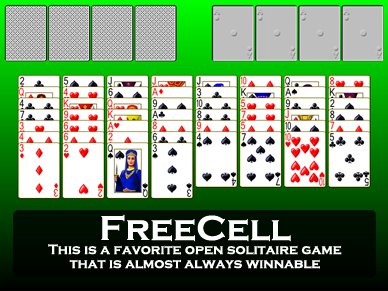 One card can be stored in each cell, just as in FreeCell. All the cells start the game empty. In the tableau, building is down by alternate color. Groups of cards in sequence down by alternate color can be moved as a unit, if there are enough cells empty that they could be moved individually. Since there are so many cells, if you keep cells empty you are able to move large groups of cards. Game play and strategy is very much like in FreeCell. 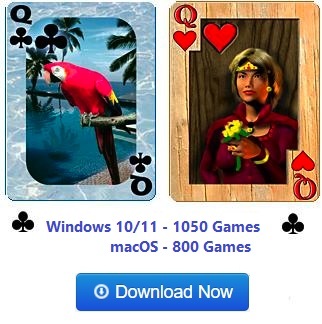 It is likely that, just like regular FreeCell, nearly every game is winnable. Scores of 100% are very common on the high scores list.